. A. 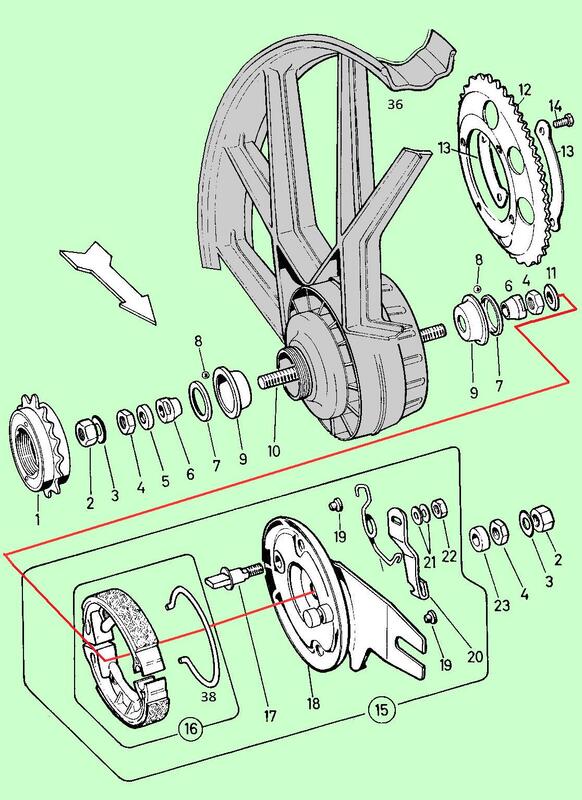 Wheel Parts Parts for sale, by type and part number.
. B. Applications What wheels have what parts and where. 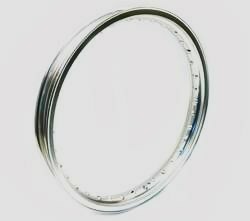 A dual chain rear hub or wheel has a bicycle type freewheel that surrounds the right rear wheel bearing. That limits the size of the bearing. That is why the balls are smaller on a dual chain rear hub than on a front hub. You would think they should be bigger, because they carry 3 times more weight than the front. 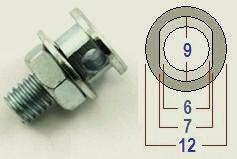 Pinch bolts (cable anchors) are offered in the Cable Parts section. Here are the common brake kinds. 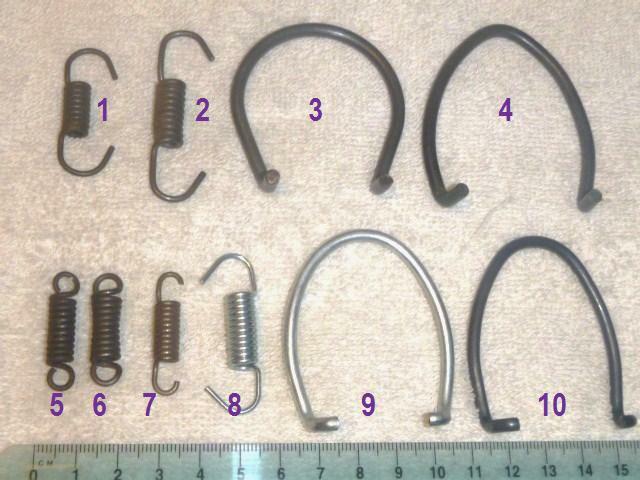 Brake springs are very strong yet compact. Hardware store springs are too weak or big. Grimeca Coil Spring: On steel hub spoke wheels, the center part of the hub is not as big, and there is room for dual small coil springs. Their advantage is they are much easier to install. 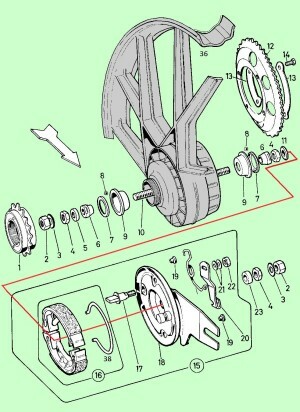 Brakes can be folded like “from a taco to a tortilla” for installing and “from a tortilla to a taco” for removing. 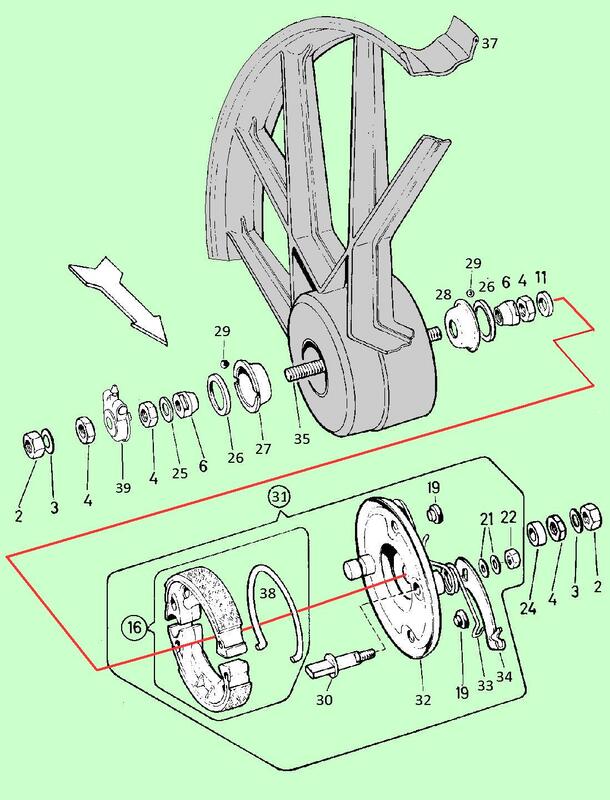 Grimeca U-Spring: A second type would be the same brake shoes and brake panel, but with the two spring holes near the cam drilled bigger and a free floating horse shoe spring instead of the dual coils. 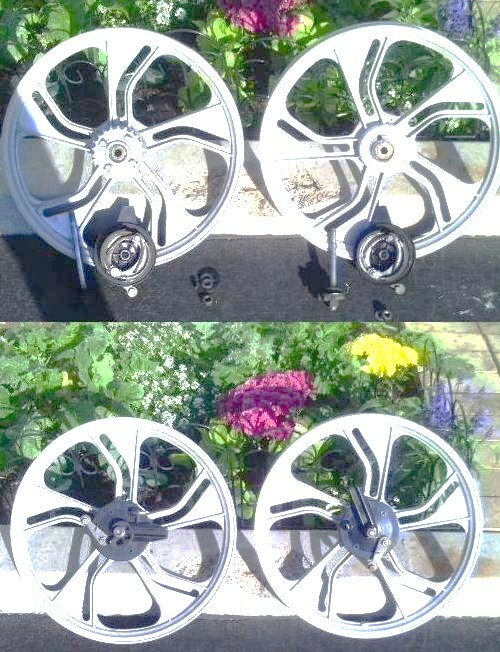 This design is needed for aluminum wheels that have a bigger center portion. Without the “U” spring, the coil springs would rub. 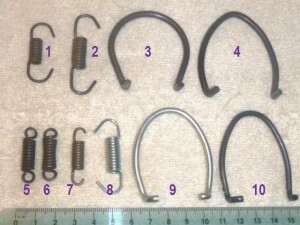 A U-Spring uses the same brake plate as coil springs. There is no visible difference on the outside, between a U-spring brake plate and a coil spring brake plate. Grimeca V-Spring: A third type is special plate and shoe set designed to be horseshoe spring only. The brake shoes each have a pencil size hole at one end. The stationary post (opposite the cam shaft) goes through the hole in each brake and has a notch at the end for the horseshoe spring. This non-floating horseshoe spring is more “V” shaped. It is held at the tip of the V by a rounded groove in the pivot post. The V-Spring brake shoes are also nicknamed “hole kind”. There is no visible difference on the outside, between a V-spring brake plate and a U-spring or coil spring brake plate, but inside there are three differences. 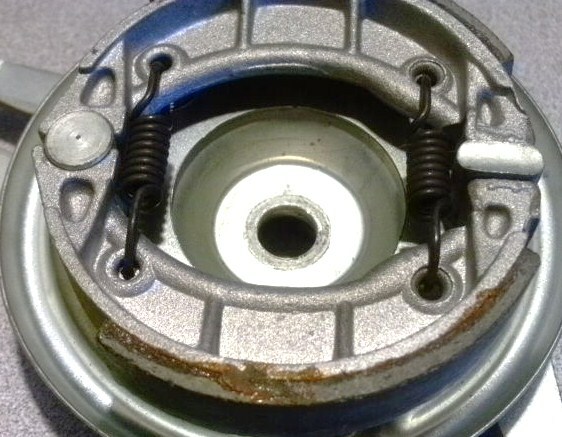 1) the cam shaft on a Grimeca V-spring type has a retaining plate, while a coil spring type has no plate (to allow installation by “folding the taco into a tortilla”). 2) the pivot post on a Grimeca V-spring type is longer and has a rounded groove for the V-spring. 3) the pivot post on a Grimeca V-spring has no center groove for retention, while the coil spring and U-spring types have a center groove (for the center ridge on the shoes). The V-spring design has better retention and safety, but is more difficult to install, because it requires a huge force to spread. 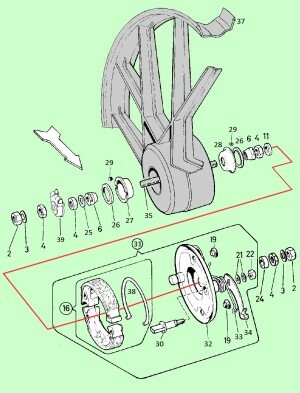 See how to spread a V-spring using a home made spreader tool, in the Wheels Service section. Brakes are listed in a separate section. Here are just some of the common ones. These brake cams are for Grimeca compatible brake arms with the Ø10 x 6 hole shown. The back sides of those with U or V-springs. Late 80’s brake plates 5 and 6 cannot substitute for early 90’s plates 7 and 8, because the ’92-95 wheels have a thick aluminum lip that sticks out past the edge of the steel 90mm brake drum. They can only when the steel sheet metal outer edge is ground off, by maybe several millimeters. All Tomos brake plates, made in Slovenia, interchange with Grimeca Italian made ones. The brake shoes, cams, also interchange. 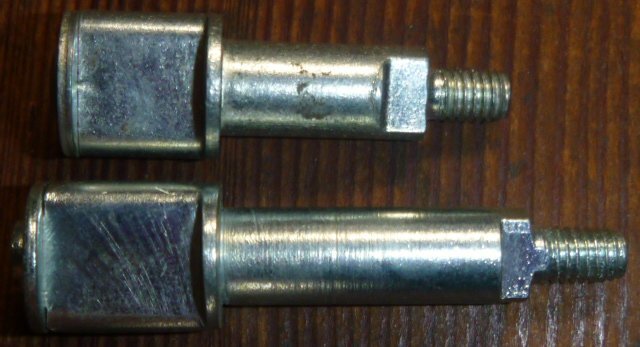 Tomos had their own “6mm loop” pinch bolt until 1991. So their early 209258 brake arms were “Tomos only”. After that they used the old H60 Grimeca pinch bolt and H59 Grimeca brake arm. The same wheel parts are used on many different models. So each brand had a different parts catalog, that specified many of the same parts, but called them by different names and part numbers. Here, instead of having each brand’s parts catalog, containing many repeat items, they have been combined into one price list and many applications charts. Each application chart is an exploded view illustration with a table of part numbers. Each row is an item in the illustration. Each column is a different make or model that it goes on. The Wheel Parts price list above is followed by the Applications below. They say what part goes where, on what model, but not whether or not that part is for sale. Note the part number or specification for it, then scroll up to Wheel Parts to find it’s one-line listing. If there is a price there, then that part is for sale. If it says N/A then it is not available. 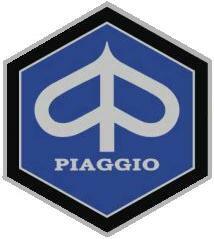 Grimeca steel hubs or cast aluminum wheels (mags) are made in Italy. Grimeca is a world leader in motorcycle wheels, with many firsts, including the first disk brake, Ducati 1971, and the first light alloy wheel, Morini 1974. Grimeca single-chain rear, and front spoke wheel hubs are used on Italian mopeds, including Baretta, Benelli, Bianchi, Cimatti, Colt, Concord, Fantic, Gadabout, Gitane, Intramotor, Maico, Malaguti, Moto Guzzi, Motomarina, Motobecane Sebring, Motron, Negrini, Pacer, Safari, Scorpion, Snark, Testi, and others, plus some non-Italian models of AMF, Colombia, NVT, Trac, Tomos, and others. Grimeca double-chain rear, and front spoke wheel hubs are used on Sachs, KTM, Kynast, Odyssey, Badger. There is a motor chain sprocket and brake on one side, and a smaller bicycle chain freewheel sprocket on the other side. Grimeca single chain rear, and front cast alloy wheels: are used on Italian mopeds, including Bianchi, Colt, Concord, Fantic, Gadabout, Malaguti, Motomarina, Motobecane Sebring, Motron, Negrini, Safari, Snark, Testi, and others, plus some non-Italian models of Trac, Tomos, and others. Most are the snowflake style, others are 5-star, 7-ray. 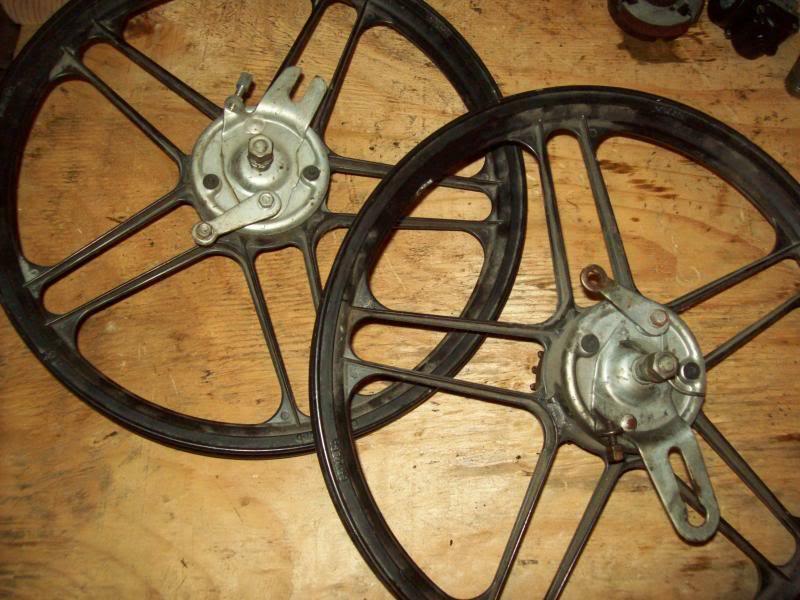 Grimeca double chain rear, and front cast alloy wheels: are used on Puch, Sears, and JC Penney. There is a motor chain sprocket and brake on one side, and a smaller bicycle chain freewheel sprocket on the other side. Grimeca cast alloy 2-chain rear wheels were only made in the snowflake style. Spoke wheel hubs: Grimeca makes stamped-steel hubs with 90 or 105 mm brake drums, and 30, 32, 35, or 40 mm center holes. Within the 90mm drum size, there are at least 4 different single-chain hub bodies, with different spacings, and at least 2 different double-chain hub bodies. 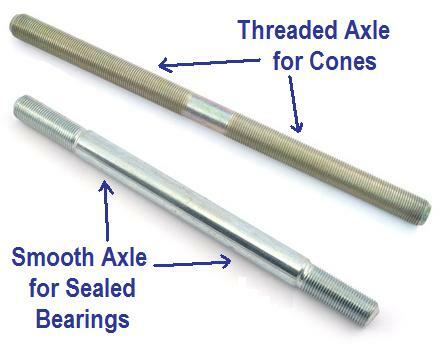 Each one of those hub bodies can have different axle lengths and axle spacer lengths possible. So there are dozens of configurations possible. Most 90mm Grimeca hubs have 11mm axles and axle components. 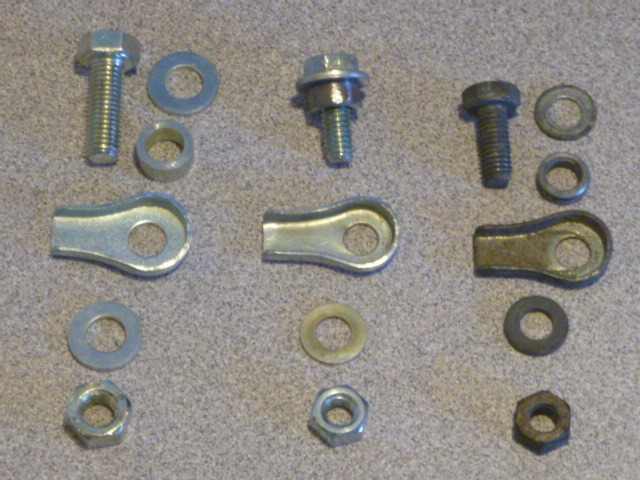 Most 105mm hubs have 12mm heavy duty axles and axle cones, locknuts, nuts, washers, and spacers. 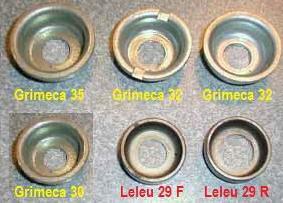 Six versions of front Grimeca 11mm axle, 90mm drum, loose bearing hubs are shown here, but more exist. Three versions of front Grimeca 11 or 12 axle, 105mm drum brake, loose bearing hubs are shown here. Five versions of 1-chain rear, loose bearing, 90mm Grimeca spoke wheel hubs are shown here, but more exist. Three versions of Grimeca 11mm axle, loose bearing, 90mm brake drum, dual chain rear hubs are shown. xxxxxxxxxxxxxxxxxxxxxxxxxxxxxxxxxxx loose bearing, single chain rear “mag” wheels are shown. 0 M6Bxxx xM6xxxxx M6BLxx M6Lxxx 1 wheel 1.35×16 comp. 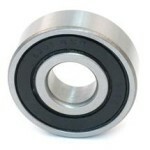 xxxxxxxxxxxxxxxxxxxxxxxxxxxxxxxxxxxxxxxxxxxxxxxxxx loose bearing front “mag” wheels are shown. xxxxxxxxxxxxxxxxxxxxxxxxxxxxxxxxxxxxxxxxxxxxxxxx loose bearings, 2-chain rear “mag” wheel is shown. 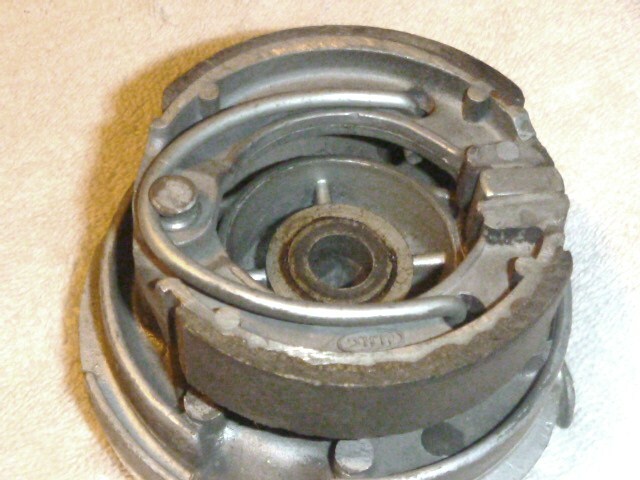 One version of Grimeca 90mm sealed bearing rear hub is shown. It was original on the two-person models Garelli Gulp and VIP. This was one of only a few 1970’s moped Italian wheels with sealed bearings. By the 1990’s it was the opposite, most moped wheels had sealed bearings. Here Garelli has made adapter sleeves with lips, that the sealed bearings fit into. The lips on the sleeves prevent the press fit (or sliding fit) bearings from moving gradually sideways. The inside holes of this and the other stamped steel Grimeca hubs are smooth tubes, 30, 32 or 35mm ID. 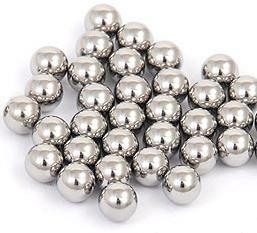 So they are not designed for sealed (lip-less) bearings. 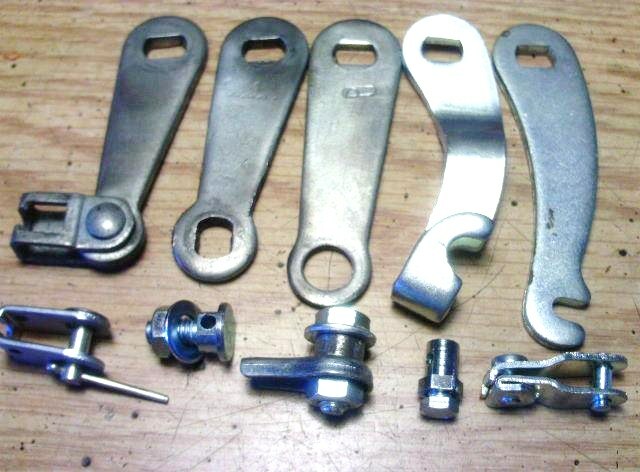 In 1975 to 1991 Tomos mopeds with spoke wheels had their own Yugoslavia-made sealed bearing machined aluminum hubs, brake shoes, and stamped steel brake plates, all Grimeca compatible (same drum diameter, width, and location, same cam and pivot shaft locations and sizes). These aluminum hubs have way less broken spokes, compared to the equivalent stamped steel Grimeca hubs. The spoke holes are machined, not punched out. But the rear sprocket lacks a strong center support, so the sprocket bolts work loose as the soft metal deforms. Many sprockets have become not centered. These hubs have a machined inner lip on each side to retain the sealed bearings. This is needed because the sealed bearings don’t have outer lips, like Grimeca loose bearing cups have. So these hubs are made for sealed (lip-less) bearings, while Grimeca loose ball hubs are not. Colombia sealed bearing 105mm moped hubs were mostly American made. There are two kinds, 1-chain-type stamped steel and 2-chain-type cast aluminum. 1-chain Stamped Steel Hubs: This is for the Sachs engine Columbia. The brake is on the right, sprocket on the left. The center hole was a massive 40mm, with 40×35 adaptor sleeves with thick lips holding large sealed bearings, 6202-8 12.7 x 35 x 11. 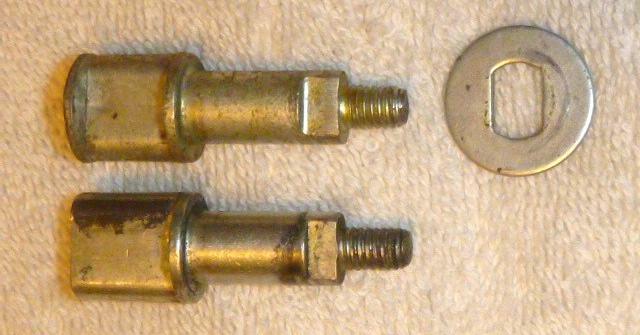 The axles were long 1/2 inch bolts (12.7 mm). These hubs would normally have 15mm axles and 6202Z bearings, on a small Italian motorcycle. The rear brake is on the right, and the sprocket is on the left. These heavy duty stamped steel hubs were made by Grimeca and used on the early (1977) Columbia sheet metal frame models with a Sachs engine. Later models had the 2-chain cast hubs made by Columbia. 2-chain Cast Aluminum Hubs: This is for the Solo engine Columbia, with both a pedal and motor chain. 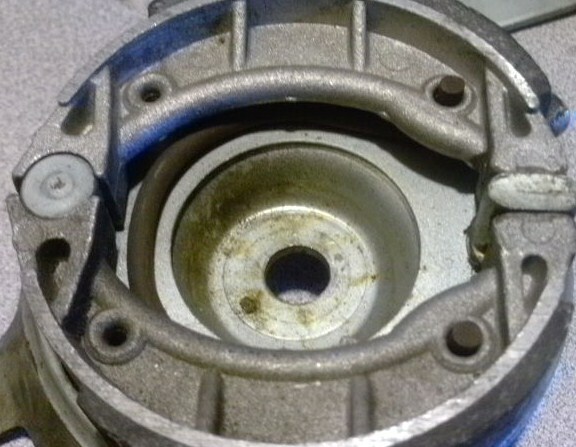 The Sachs engine Columbia also uses these hubs on certain models, but no freewheel or pedal chain is installed. The rear brake and sprocket are both on the left. The hub center is small 28mm stepping to 24mm in the center. The step retains the lip-less sealed bearings, and so no adapter sleeves are needed. From 1989-1995 Tomos mopeds had die cast aluminum wheels with sealed bearings and 90mm brake drums, Grimeca compatible. Tomos made these wheels and the cast aluminum brake plates and other brake and axle components. These Tomos “web” mags replaced the earlier Grimeca “5-star” mags. The 2005-2008 Tomos Arrow rear drum brake was 110mm made in Italy. 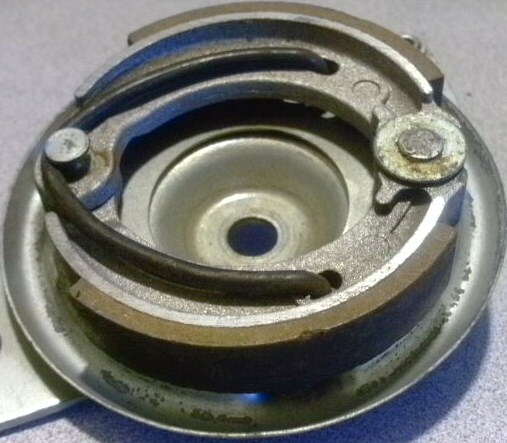 The 2001-2003 early Tomos Revival rear drum brake was 118mm Grimeca. The front hydraulic disk brake was also Grimeca. But most Revivals 2004-2012 had a 105mm Grimeca rear drum brake. 2004-07 Revivals had an AJP front brake. 2008-2012 Revivals had a generic front brake. 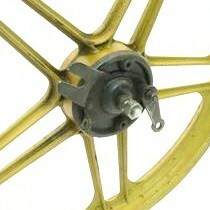 The 1978-1981 Safari Commando rear drum brake was 118mm Grimeca. Mag wheel models of Trac (Korea), and spoke wheel models of Carabella (Mexico) and possibly Wheel King (Taiwan). Leleu cast aluminum hubs are made in France. E. Leleu et Cie (E. Leleu and Co.) made quality drum brake hubs for mopeds and small motorcycles, since at least the 1950’s. Leleu hubs are original on Peugeot, Motobecane, Solex, Sparta, Puch, Batavus, a nd Kreidler mopeds. 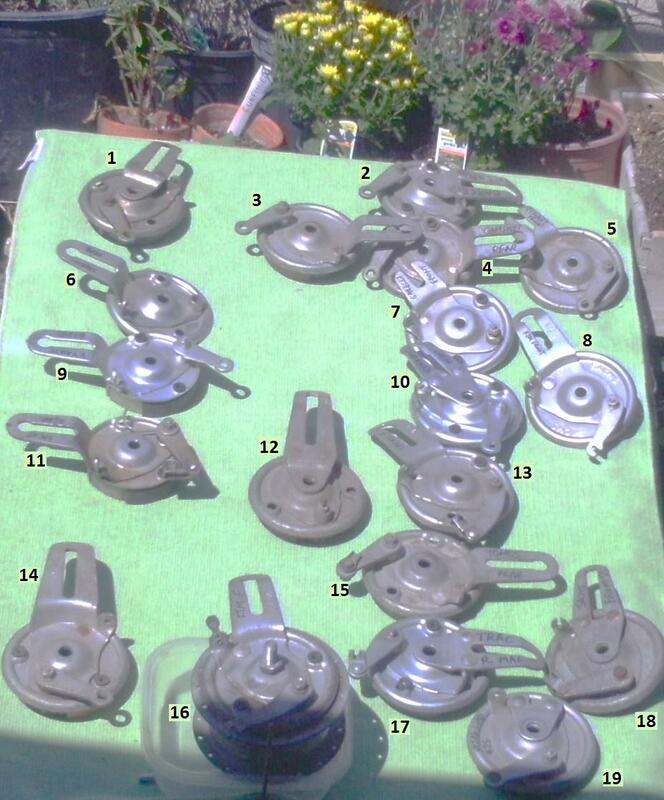 1970’s US models were mostly all 80mm brake drums, with some 70mm. 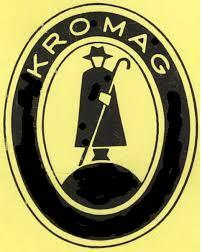 But earlier French mopeds in the 1950’s and 60’s commonly had 100 mm, brake drums. 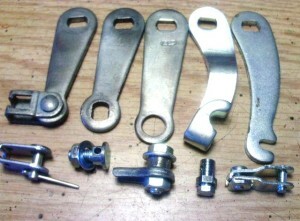 Motobecane made many of their own components. Like the way Tomos made their hubs compatible with Grimeca, Motobecane made their hubs compatible with Leleu. So the complete wheels interchange, the brake plate complete interchanges, but most of the individual parts do not. Motobecane made both stamped steel and cast aluminum spoke wheel hubs. Their cast aluminum hub has a big M logo embossed into it. Taiwan wheels are on Taiwan mopeds. They do things more like motorcycles and less like bicycles. Asian wheels always have sealed bearings, with axles that slide out, like motorcycles. 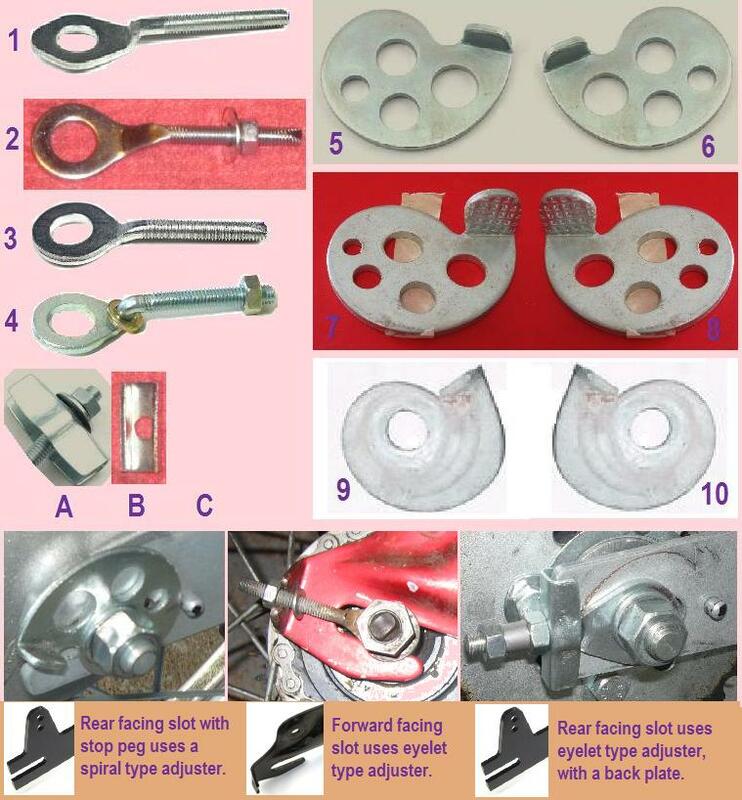 Asian spokes have inner and outer types, like motorcycles. Asian hubs are always cast aluminum, never stamped steel, like motorcycles. Asian hubs are always single chain rears, since they do not “believe” in having both a motor and pedals at the same time. You are currently browsing the archives for the Wheel Parts category.